Old Coronado BF30 - SolarChat! I just bought an old BF30, made in 2000 or 2001. The BF can be tilted, shows no corrosion of the ITF. But what a difference compared to modern blocking filters. It let's through far more light, look at the image. So that will be the problem I guess: more light of a bandwidth you don't want to image, lower contrast etc. Will try it out with a Baader 35nm and a Beloptik UV/IRcut. Could be Apollo will try it out. In my normal set up I use already a Baader D-Erf and a Baader 35nm H-alpha filter. So let's hope there is some sun this weekend and find out how the image on the screen looks like. Is it supposed to be a full BF30 filter assembly? An ITF plus a final blocking/ sort filter??? Yes it is. In fact it is a kind of Skybender with an ITF and some kind of blocking filter. It is complete apart from the 2 inch nosepiece, but that can be easily replaced. If you turn the ring, you tilt the filters. You see the same blue colour. In those days the front etalon could not be tilted. CS, Bart. 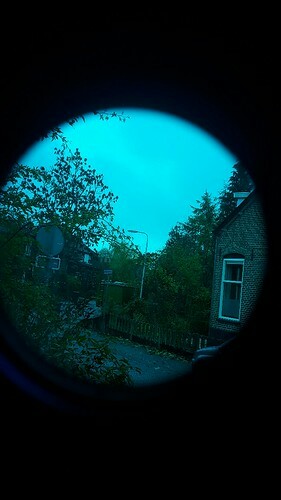 I have that nice blue colour when looking through my Solarscope blocking filter. Thanks Alexandra! And are you able to tilt the blocking filter or can the solarscope etalon be tilted? It isn't tiltable, but the etalon is. But wasn't Coronado Solarscope in those days? I am not sure if it started as Solarscope or as Coronado. As far as I know, the first Coronado Etalons were made in the Isle of Man. Ken Hugget continued in the Isle of Man with Solarscope UK. Lunt took Coronado to Tucson. Coronado was sold to Meade and after a period of time, one or two years (?) (part of the deal with Meade? ), the former owners of Coronado started Lunt. A good forecast for this weekend, so really looking forward to try the new blocking filter! Last edited by bart1805 on Tue Nov 13, 2018 9:19 pm, edited 1 time in total. There are many important considerations if you are putting together a system made from older parts or those of unknown origin: Coronado Instruments would like to caution people that you cannot swap Coronado blocking filters and narrowband front elements ad hoc without the risk of compromising safety. NEVER pair a blocking filter from an Isle of Man production run (AS1 series filter) with a US-produced SolarMax series filter. The blocking elements have been reconfigured in the US produced models and the older, Isle of Man blocking filters are NOT compatible from a blocking perspective with the newer front narrowband elements. Coronado can retrofit additional blocking to older blocking filters to make them compatible with newer narrowband elements. They strongly advise anyone considering pairing a front narrowband element with any blocking filter (other than the one it was originally supplied from the factory) to contact OPT to determine if additional blocking is required. Coronado Instruments and OPT will not be held responsible for problems caused by improper matching of filter elements. I found that in the beginning the retrofit of the older Blocking filters costed 75 dollar. So for that amount of money it seems they swapped the ITF for a different one, or added a extra UV/IR blocker? I had at one time a IOM tilting BF20 which I hoped to use with an SM40...this was back around 2007. Never worked well for me. 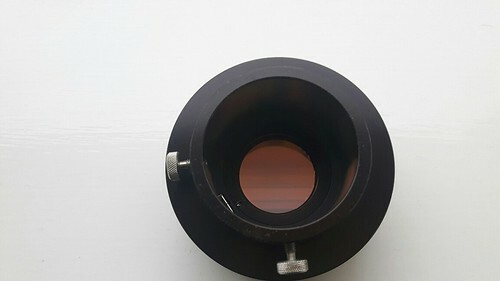 The Isle of Man blocking filters were designed for an etalon with a higher finesse and narrower FSR than the later Coronado or Solar Scope etalons. As opposed to today's Coronado and Solar Scope BF's with about a 6-8 A FWHM, the one in question probably has a 2-3 A or so FWHM, and these had hard coatings and were quite expensive, and also the reason later BF's wont work well for the narrower FSR etalon's from Coronado of that era. The narrow FWHM also is the reason the BF requires tilting to get it to "track" the CWL of the original Coronado etalons as the BF responded to temperature changes. The original Coronado etalons allegedly were highly temperature stable and required no tilt tuning of there own. "The filter is dimmer than the the regular BF30." This is very likely why the seller was getting rid of it. The coatings, as well as substrate density and thickness are often used to vary the image brightness to whatever was thought to be appropriate at the time for the etalons that it was being matched to. The filter may or may not have used an ITF. The current Solar Scope BF's use KG heat absorbing glass, the Lunts use BG glass, all with the intent of longer IR blocking. This is where the concern for mix and matching components of various brands and era's comes form - e.g. how good is the out of band blocking. A high quality ~ 30 nm nighttime H alpha filter acting as a pre-blocker, and high quality UV/IR blocking system would be of paramount importance if used visually. The filter I got was exactly as described in the advert. So I already knew that it was dimmer than a regular BF30. I bought it, and am really happy with it. Very interesting to see with my own eyes how it looks exactly and to be able to try it out myself. And the price was really reasonable. The seller told me in a email conversation that there is no ITF, it is just the Blocking Filter. No doubt a killer deal, as the filter itself is probably worth 10 times the price advertised. Your proposed ancillary filters should work well, as the DERF will block UV and near IR, the 35 nm H alpha has the needed RG filter, and the UV/IR KG3 will fill the role of an ITF. Tilt it a degree or two if possible and place ahead of the Coronado BF. Oliver suggested the same. 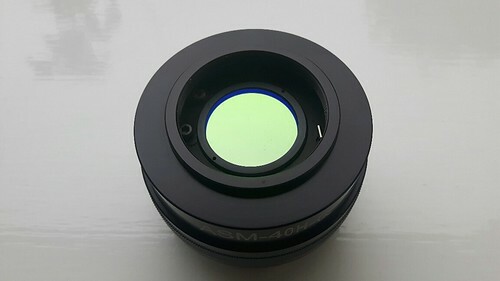 But I just bought the UV/IR on KG3 (for the CaK filter) and will now also try it with the BF30. Single stacked the exposure times in H-alpha with the ASI290mm were so short I had to use a ND0.6 filter. So a bit darker is no problem at all. I know the guy that sold the filter, he lives in Portugal. I was also interested but I saw the advert a little too late. I was lucky this time! 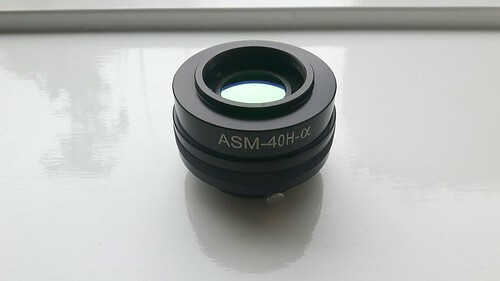 And also bought the original collimation lenses of the ASM-40. No real use for it at the moment, but nice to experiment with. Has anyone got an idea what the thread is on this old filter? It is close to M50x1, but not exactly. And it is not 2"x24tpi SCT thread. Could it be a standard filter thread?? May be a M50 x 0.75??? Problem solved. It is M50x0,75. And an Australian nosepiece (Ken!) fits perfect!